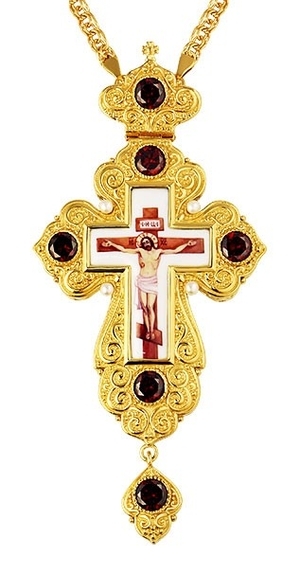 Pectoral cross - A214 (with chain) - Istok Church Supplies Corp.
Pectoral cross is made of brass and covered with 24K gold galvanized layer. The crucifixion is made using a special technology of applying a color image on a brass base and covered with a special protective compound, protecting it from damage and exposure to light. The front side of the cross is decorated with floral ornament and inserts of phianite stones of excellent quality, hand bracing. The cross is sold in a presentable man-made leather packing with velvet lodgment. There is a matching Bishop encolpion-panagia for this cross with SKU: PGA-0874LP-1.